Perfect transportation tool for any home lawn and garden enthusiast. Use the Gorilla Cart to haul everything around the house and farm, from hauling garden supplies, to sporting equipment, to landscape materials. The heavy duty poly bed is maintenance free, easy to clean, and will not rust. The patented quick release dumping feature makes unloading safe and easy. 4 wheel design maximizes stability on any terrain. 10" pneumatic turf tires make transporting mulch, soil, plants, and rocks an easier task. 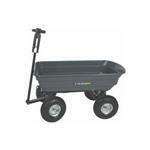 The Gorilla Garden Cart #GOR200B has a 4 cubic foot capacity with 600 lb hauling capacity.